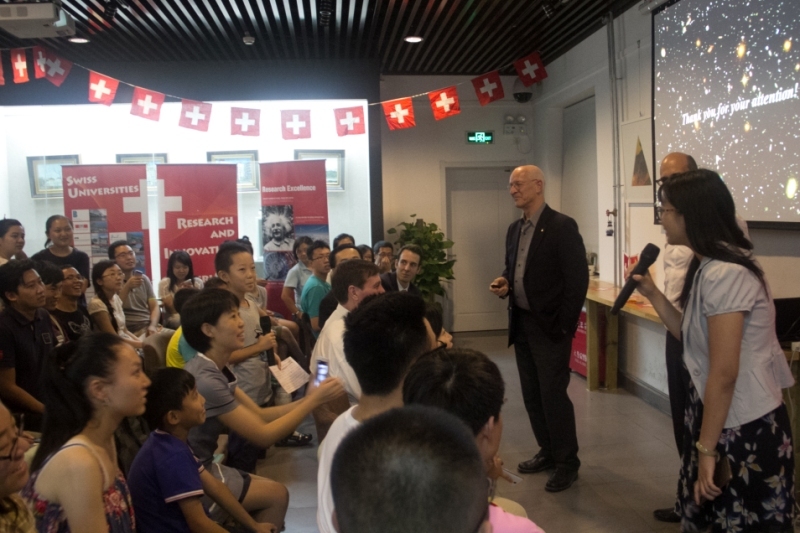 Claude Nicollier, the first and only Swiss astronaut, held the fourth ISSI-BJ Understanding Science Talk on “Hubble: 25 years of utilization and on-orbit servicing” and fascinated the audience with his personal insights on an astronaut’s life in space. More than 50 young students listened to Prof. Nicollier’s explanation on the invention and implementation of the Hubble telescope, which is celebrating its 25th birthday this year. The Hubble Space Telescope, joint project of NASA and ESA, was installed on a Low Earth Orbit by the Space Shuttle in April of 1990. Suffering from a serious optical problem, it was visited for the first time by another Shuttle crew to recover the expected optical quality and exchange other components. Since that time, in became a very productive space-based astronomical facility and was visited again during four extra servicing missions until May 2009 to maintain it as an up-to-date instrument of superior performance. It has been used extensively to study the Solar System, protostars and star formation regions in our galaxy, as well as planetary nebulae, galaxies, clusters of galaxies, and the very deep universe as well. Both the servicing aspects of the telescope, and the scientific accomplishments it made possible, were presented in Nicollier’s lecture. He told about his training and service of the first and the third missions to the Hubble Space Telescope and his space walk outside the telescope. The audience was taken in by his personal description of the takeoff. Claude Nicollier further showed pictures taken by the space telescope to emphasize the achievements of Hubble. Before his talk, Claude Nicollier visited ISSI-BJ. Eagerly learning about the Institute’s past achievements and future plans, he discussed possible activities with ISSI-BJ’s executive director Maurizio Falanga. About the speaker: Claude Nicollier, born in Vevey, Switzerland, in 1944, is a Professor in aerospace engineering at Swiss Federal Institute of Technology in Lausanne, Switzerland. He graduated from the University of Lausanne in 1970 (Bachelor of Science in physics) and the University of Geneva in 1975 (Master of Science in astrophysics). He also graduated as a Swiss Air Force pilot in 1966, an airline pilot in 1974 and a test pilot in 1988. He was a member of the first group of European Space Agency (ESA) astronauts selected in 1978. He was then detached to the NASA Johnson Space Center in Houston, Texas, to train as a crewmember for Space Shuttle missions. He was assigned as a Mission Specialist on four Space Shuttle flights, including the first and the third missions to service the Hubble Space Telescope on orbit. He spent more than 1000 hours in space, and performed a spacewalk during this last mission in December 1999 to install new equipment on the orbiting observatory. He is a recipient of Honorary Doctorates from EPFL, and the Universities of Geneva and Basel. "Understanding Science - Beijing" is organized by the UK Royal Society of Chemistry (RSC), the Institute of Physics (IoP) of Chinese Academy of Sciences and the International Space Science Institute-Beijing. Its goal is to make a broader public aware of today’s accomplishments in research through short scientific lectures in English (popularization talks) as well as to have an opportunity to talk with either international or Chinese scientists currently carrying out research in China, in an informal, international and multidisciplinary environment.